The SuperAdmin user manages an ApiOmat installation and has all the tools necessary to manage the platform. 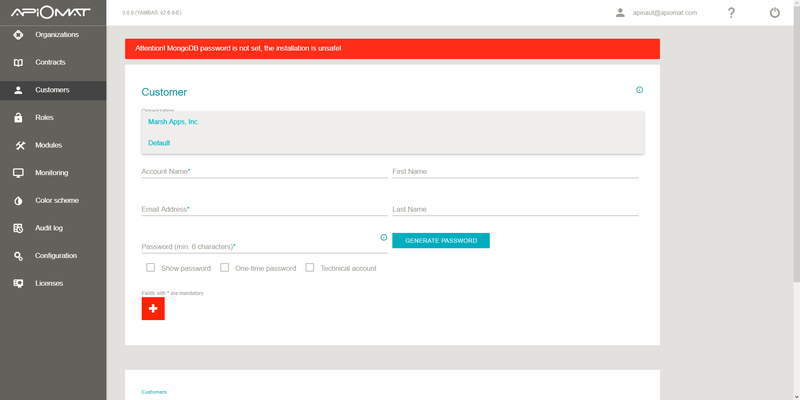 By signing into ApiOmat as a SuperAdmin, the user has access to the administration dashboard. 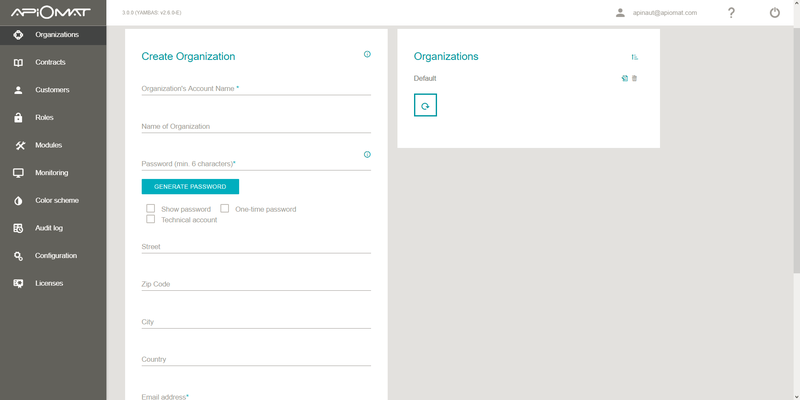 The SuperAdmin can create Organization accounts that act as an admin for a group of customer accounts. Organizations can manage and create customer users as well as assign them specific roles and access rights. More about Organizations can be read here. When you create a new organization, you will be asked if you would like to create a new customer account within that organization. 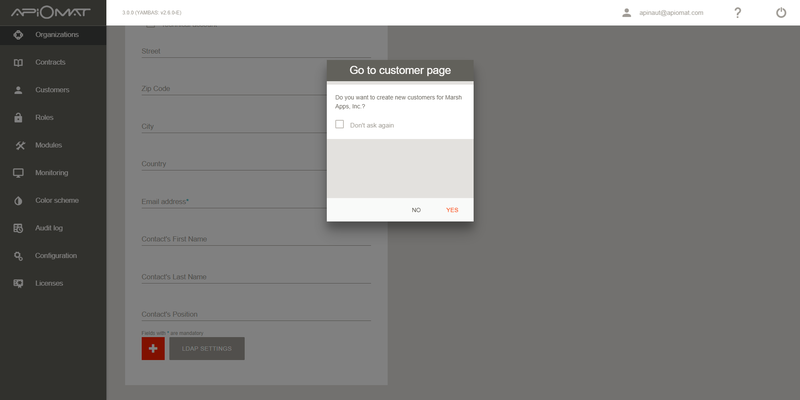 This is optional, as the organization themselves can create their own customer accounts. Contracts give the SuperAdmin a way to enforce policies to organizations and their customers. Contracts can be uploaded or written in plain text and once the SuperAdmin assigns a contract to an organization or a customer user, the organization or customer must agree to the terms to gain access to ApiOmat. Should the organization or customer not agree to the contract, they cannot access ApiOmat. You can read more about contracts here. Customers accounts are for the ApiOmat end-users. Customers included, but are not limited to, developers, system integrators, business analysts or ApiOmat Studio users. Customers are managed by an organization. 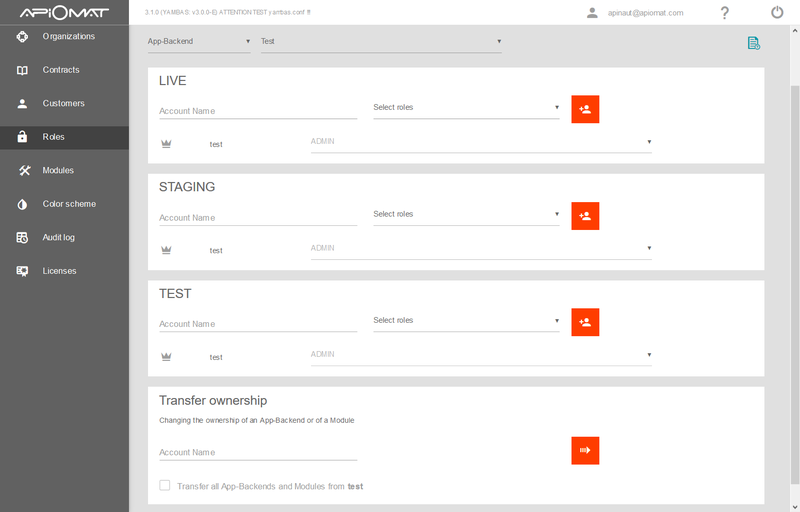 Customers can be given access to specific app backends and modules and can create their own app backends and modules as well. 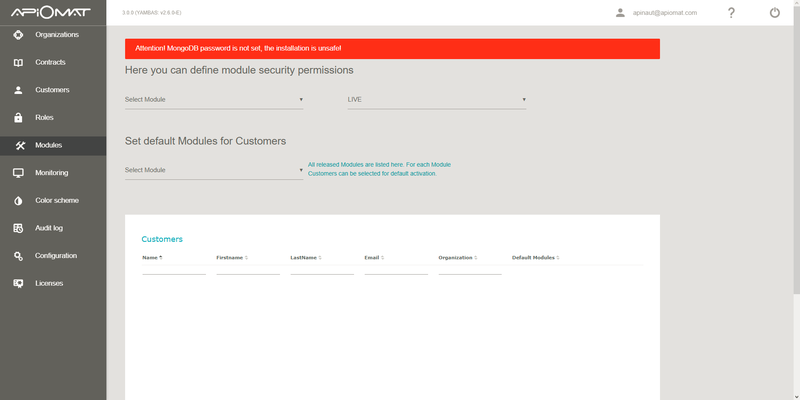 Customers can assign roles and access rights to their backend and modules for other customers. Customers can be given roles and access rights to specific backends, environments and modules or transfer ownership. The SuperAdmin can manage the access rights of any customer and organization. You can read more about roles here. The Audit log contains a security-relevant set of records documenting all changes done in or via ApiOmat. Only the SuperAdmin has access to the Audit Log. You can read more about the Audit Log here. 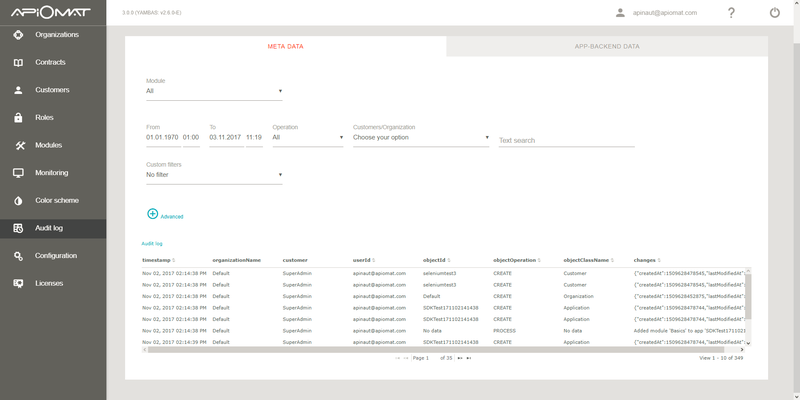 Audit Logs are available on a meta-data leve as well as for each individual app backend. 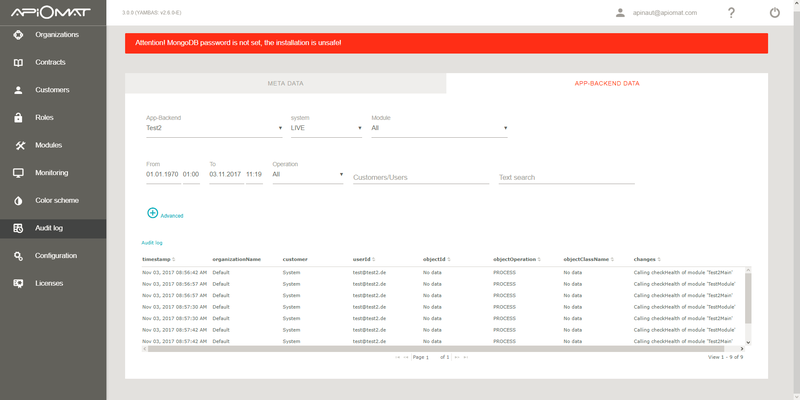 The SuperAdmin can manage the security permissions for each ApiOmat module. You can read more about the modules permissions here. Under configuration, the SuperAdmin can view and make changes to the ApiOmat configuration yaml. More information about the configuration page here. 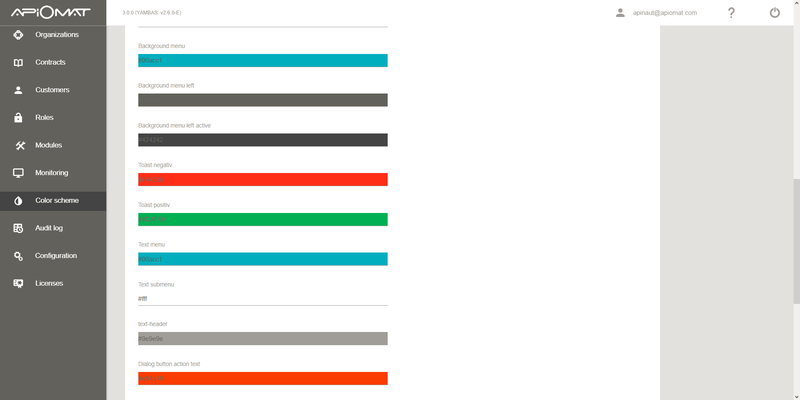 The SuperAdmin can set ApiOmat's color scheme to match your corporate design. More information about the color scheme is available here.